The register of contaminated sites has successfully been implemented in the province of Nam Dinh between 2005 and 2008. Before starting the recording of the data, we had to find out, whether the sources and methods that are used in Germany can also be applied in Vietnam. The following deals with the main results and shows the most important strategies to record data about contaminated sites. A successful treatment of contaminated sites requires a systematic and gradual procedure - such procedures have proven their value in Germany for many years. 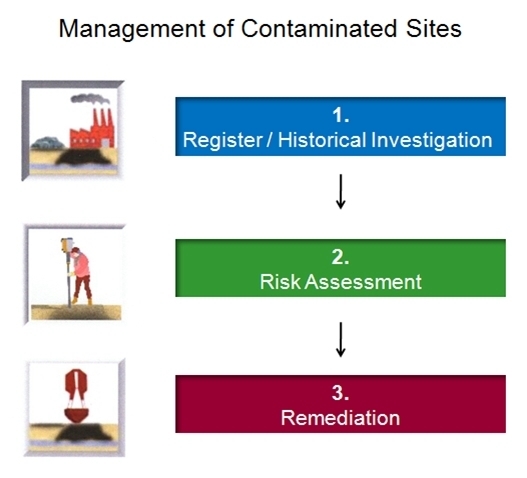 The first step of treatment is the registration (recording) of contaminated sites. In Germany, the biggest mistakes were made, when remediation took place without the steps of recording and risk assessment. assessment of the results of the investigations in the sense of a first risk assessment and further measures resulting from it. Investigations do, as a rule, not involve local investigations exceeding a potential site inspection. Boring, sounding, chemical-physical investigations etc. are basically left to the subsequent stages. The data and findings gathered are filed in registers and files and updated and represented on maps by the competent authorities. detection and localization of possibly all industrial sites and waste disposal sites situated in the area of responsibility of an authority (area-wide investigations). compilation of all detailed information required for the individual treatment (site-related investigations). Buildings and plants and their use: An essential object of recording is always the stock of buildings and plants as it has developed in the course of the history of use. To assess uses with regard to a potential pollution risk, all uses – independent of their relevance to environment – are recorded and reflected in the maps of the results. Sewerage system and sewage plants: As far as existing, the sewerage system is recorded and represented on maps. An important target of research is to record the (formerly) existing sewage plants. Waste disposal sites: Furthermore, sites will have to be determined where material has been deposited. In most of the cases, it will not be possible to determine the deposited material; however, waste disposal sites have to be recorded as deposits or backfills. Storage areas: Storage areas will be recorded as a further object category. They are defined as areas where piece goods or bulk material (partly not to be specified in a more detailed way) have been stored. when or in which period potential damage was inflicted. For practical site-related investigation, this means that only in exceptional cases, areas suspected of being contaminated on a site closed down may be immediately spatially localized and classified as to content and time. As a rule, these areas have to be localized and classified indirectly, namely through detecting all potentially polluting uses and activities including the waste disposal sites and backfills connected with them and accidents and cases of damage. site inspection to understand the current situation. As a rule, it is not sufficient to apply only one of the methods mentioned above. 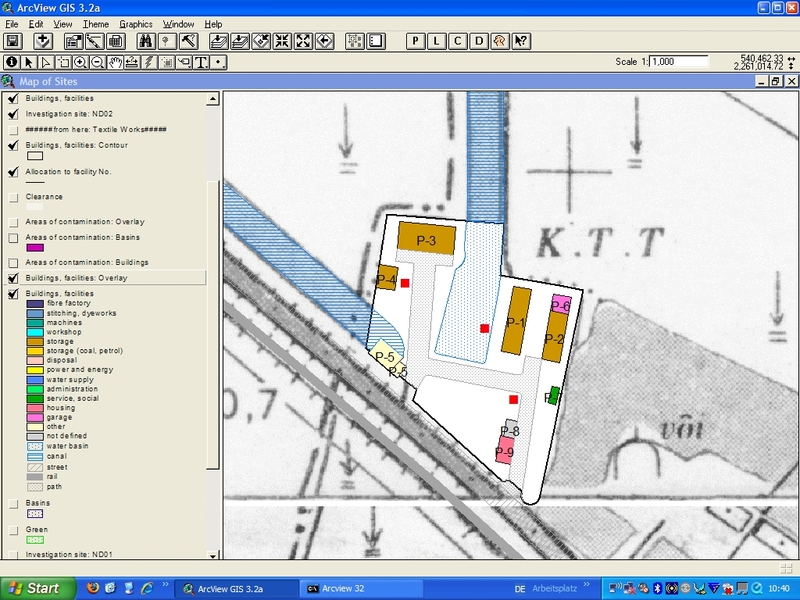 In German practice, notably the combination of the first and second methods has proved successful, whereas questioning of contemporary witnesses is to be recommended only if after completing archive research/evaluation of documents and records as well as multi-temporal mapping, obvious gaps still exist. If possible, the findings of recording should be supplemented by a site inspection. damage information relating to accidents including war damage. ownership systems (and their change). To efficiently find documents and records, it is basically recommended to adopt an approach deriving from the official regulations relating to the transmission of documents and records. Document stocks considered to be worth archiving are usually arranged and stored according to the provenance and site principle, i.e. according to sites where they have been compiled. Accordingly, there has to be, first of all, reconstructed which operations are of relevance to contaminated sites (mostly) without being indicated by the titles of the records. Subsequently, there has to be determined which authorities or company departments have been dealing with a process possibly relevant to contaminated sites. Then the archives or information offices competent for storing the records of the sites concerned will have to be found. In this connection, attention should be paid to the fact that administrative competences on the decision-making level as well as in the regional subordination (administrative reforms) (may) have changed. Furthermore, documents with information relevant to contaminated sites may not only be available on one level but, by the parallel transmission of specific records/documents, on a few archive levels. Site-related investigations will normally start with finding the relevant records on local level. Which archive or official (old) registry shall be, here, consulted preferably is scarcely generally binding but ultimately to be decided only depending on the case-specific basic conditions. If a company archive exists for the site under investigation and access to it can be provided, the research should start there at any rate. If in research on local level obvious gaps in transmitting documents appear, the competent archives on regional or national levels have to be considered in further stages. The multi-temporal mapping involves a combined analysis of maps (in particular official topographic, yet also other maps) and aerial photos with the evaluation of these area reproducing information carriers - taking place not only on one time level but – multi-temporally – in several periods. The information value of topographical maps is distinctly lower than that of aerial photos – mainly due to a generalization. The larger the scale the more suitable the map in terms of recording. The most suitable scale is 1: 5,000, followed by the scales 1: 10,000 and 1:25,000. 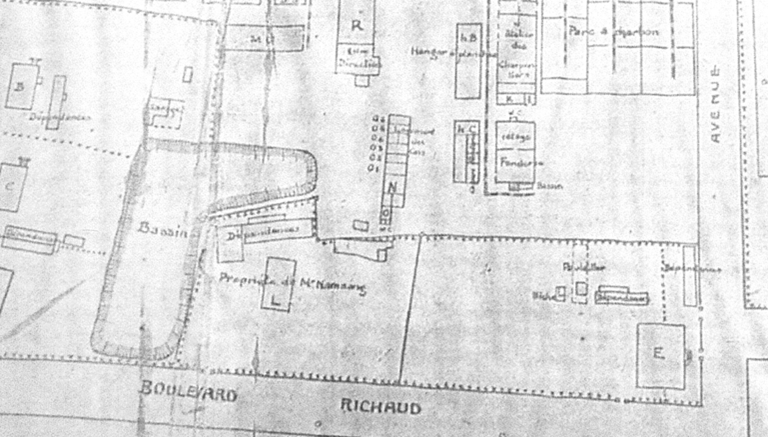 However, aerial photos are essentially more substantial than maps and document a site with all details without generalizing exactly the condition and appearance at the time of taking the photo (Fig. 3). Information relevant to contaminated sites provides aerial photos notably of fills and deposits, the supplementation and checking of the building and plant stocks resulting from the evaluation of the plant layout. In many phenomena of use, the identification of objects is possible without causing problems due to visual properties such as object shape (layout/front view), object size (length, width, height), position and arrangement on the terrain or towards other objects. Thus, among former industrial plants e. g. tanks, cooling towers and other prominent plants with unmistakable building and structural properties visible on aerial photos, as a rule, may be easily identified. However, some buildings and plants appear on the aerial photos so nonspecifically that – due to their position and arrangement – they may be only indirectly identified in their functions, with a respective uncertainty or not at all. 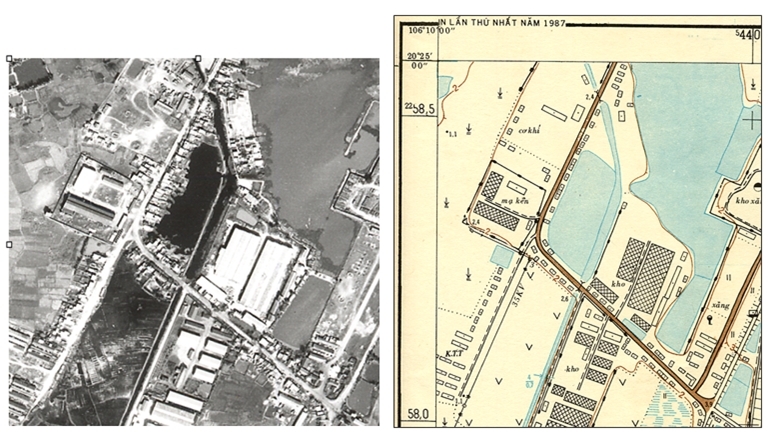 In investigating and mapping former industrial sites, the interpretation of aerial photos has to be regarded rather as a method supplementary to the evaluation of the plant layouts or – depending on the records and plans – also the other way round. The combined application of both methods is imperative to reach satisfactory results of research of the plant and building stock since aerial photos document plant (units) can often not be found in plant layouts. On the other hand, aerial photos show frequently that buildings shown in plant layouts have partly not left their “stage of planning”, i.e. have never been built. As compared with aerial photos plant layouts are so important because – as mentioned above – an assignment of the functions of (historical) buildings and plants is only seldom possible solely on the basis of aerial photos. However, aerial photos are frequently the only source to record potential waste disposal sites. Waste disposal sites may be identified on the aerial photo by various features. On a black-and-white aerial photo they stand out by a lighter or darker grey shading – independent of a. o. material properties and incidence of light. 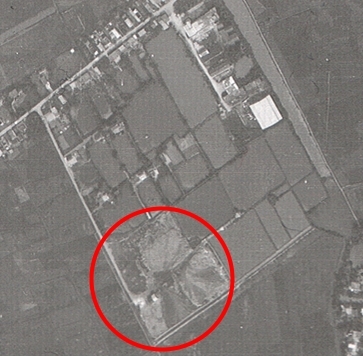 On an aerial colour photo possibly colour properties of a waste disposal site or its surrounding facilitate its identification (fig. 4). The contours of waste disposal sites are mostly irregular and not always clearly definable. As a matter of fact, many types of waste disposal sites in their original state show carrying-over seams of a few meters which render impossible sharp fencing even on the terrain. The three-dimensional character of former waste disposal sites should be detected by means of optical instruments rather than through hard shadows. The use of stereoscopes is obligatory for the identification of former waste disposal sites. The multi-temporal evaluation of aerial photos allows to map various dumping phases and – if existing – to identify also a change of material. If questioning should bring useful results it has to be ensured that the persons questioned have founded special and also respective site knowledge. In addition, they should have a sufficiently reliable memory and, last but not least, they should be ready to give unreservedly information about processes and facts relevant to the environment. Though, in current cases, it is in general not very difficult to find contemporary witnesses meeting largely this requirement profile, if knowledge about facts longer ago has to be obtained by questioning, finding suitable interview partners may prove to be a problem. In Vietnam, some special, culture-specific problems concerning the questioning of time witnesses may occur – and have previously occurred. Since the aim of the management often is to evoke an impression of already sufficient measures being taken, not all witnesses meet the standards that need to be employed to gain relevant pieces of information. Although the government and local authorities are recognizing the importance of environmental protection, the appearance of a company on the list of Decree 64 is still widely considered to be a “shame”. The results of questioning contemporary witnesses – even if prepared and carried out in a professional way – always need to be assessed critically. In fact, questioning may impart absolutely new, basic knowledge on uses of the site relevant to environment and thus contribute to supplementing the data stock of a site-related investigation. This, however, applies predominantly to uses and events of a more recent date. clarification of building and plant functions so far uncertain. In addition, type and state of sealing and further parameters relevant to the assessment and depending on the individual case may be collected. Ideally the site inspection is carried out accompanied by a person knowing the site and, if necessary, again in combination with questioning of contemporary witnesses. If the advantage of a site inspection for supplementing the findings of the research and the documentation of the actual state is undisputed, its importance to site-related investigations is often overestimated. It need not be further commented that site inspections may, as a rule, supply information on a very small part of the history of use of a site, namely notably on the condition of the terrain after the plant was closed down. Changes of the building and plant stock, overgrown waste disposal sites and backfills are only a few exemplary categories that cannot to be investigated with the means of site inspections. During site inspection, attention must be paid to industrial safety measures at all times. no contamination risk (as all uses are recorded, among others, of course, also such uses which are not connected with a contamination risk). site data: are data assigned to the site, informing on geographical details (such as co-ordinates), legal facts (such as owners) and aspects relevant to environment (such as industrial plants, accidents). Area and site information are linked with each other through indices and are constantly updated. Formerly registers of contaminated sites were always arranged in parts of maps and records compiled and continued manually. 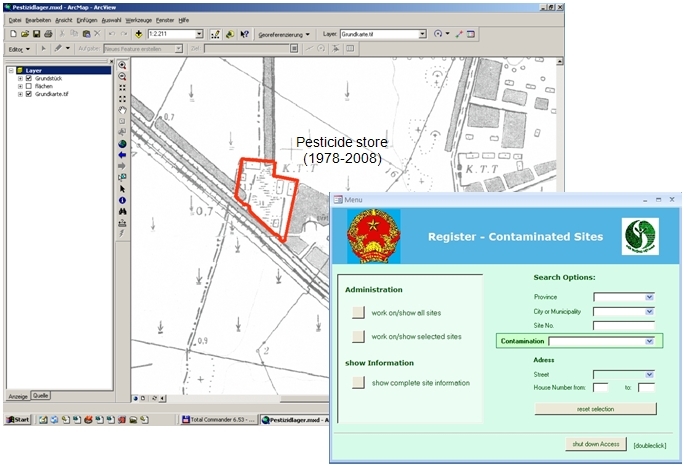 Today registers of contaminated sites are compiled and continued by means of a data bank and GIS software. The digital „register of contaminated sites“ allows a comparatively faster access to individual data and is easier to be continued at lower costs. detailed information on the respective sites is available. The database contains some data fields, like the exact localization, the owners, the current use and benchmark data of the historical development of the site. The most important class of information is the current and former use of the buildings and facilities of the site. Fig. 6 shows as an example the function of each building of a pesticide store as well as the time of use. These data are directly linked with the Geographical Information System. 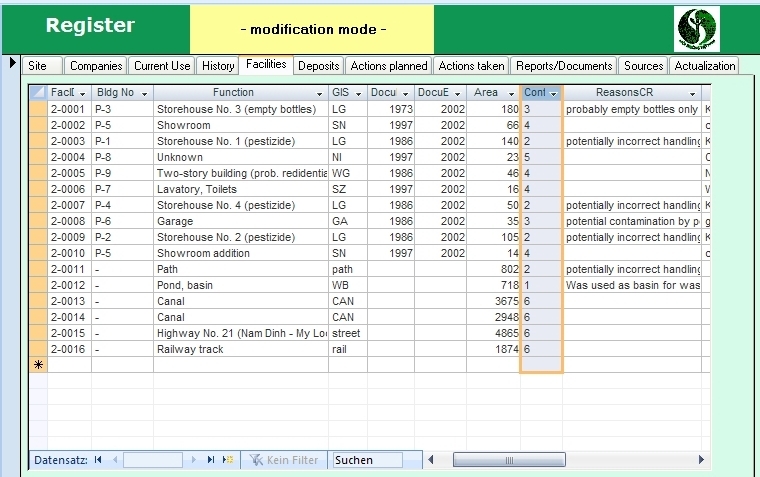 Figure 7 shows all the buildings of a pesticide store in different colors, which refer to their special function. The investigation data provide the basis for decision-making on further measures of site-related environmental management. Only if it is known whether and where on a site uses suspected of causing contamination have taken place follow-up stages of sampling and analyzing can be planned purposefully. But with the recording data especially grave environmental impacts may be recognized early and respective emergency measures can be initiated. Thus, the health of the population concerned will be immediately improved. Preparing of digital maps and plans in the framework of recording forms also the basis for planning all further measures not only of specific treatment of contaminated sites but also for other fields of environmental management (monitoring data etc.). In Germany the planned approach has proved to be a most low-cost alternative. Thus, making costly wrong decisions due to a lack of site information will be largely avoided. In Germany the principle is applicable: that money which is invested in data collection will be repeatedly saved later on due to reliable decisions being made on the basis of a solid data stock.